The Stryker 1288 HD Endoscopy Tower System offers facilities a simple, high-quality solution for all of their endoscopic imaging needs. Each component — camera, light source, monitor and insufflator — fits conveniently into the mobile cart for maximum portability. Crisp, 1920x1080p resolution with nine specialty settings for optimum visibility. Complete with four fully-programmable camera head buttons, touchscreen LCD interface and wireless transmission capabilities. Bright 300-watt xenon elliptical bulb delivers accurate, detailed, state-of-the-art imaging. When used with the Stryker 1288 HD 3-Chip Endoscopic Camera, the light source allows clinicians to capture high-definition video during any procedure. Superior performance with unprecedented safety and reliability. Maintains pneumoperitonium under the most extreme conditions with a multitude of safety features. 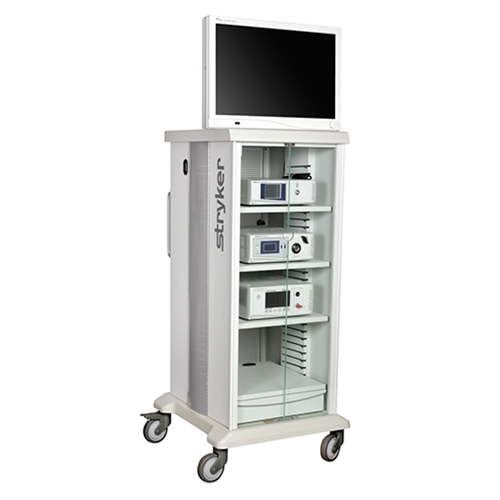 Each tower includes a high-definition video monitor and a mobile cart for easy transport throughout your facility. Questions about our Endoscopy Systems? Soma Technology, Inc offers a wide range of Endoscopy Systems. If you have any questions about any of our Endoscopy Systems, or need a quick quote, call 1-800-GET-SOMA and one of our knowledgeable sales representatives will help you.